“I never knew that I had fibroids until I was pregnant with my second child,” says Claire. “I did not have them four years earlier when I had Amy but when I went for my routine scan, even I could see large shapes around the baby that just shouldn’t have been there,” she explains. Claire’s 20-week ultrasound scan revealed three large fibroids, one within the wall of her uterine muscle and two on the outside. One was flat and right up against the outer wall of the womb and was the size of a saucer. The other two were smaller. Luckily, the one inside the muscle was only the size of a pea. Nevertheless, the presence of the fibroids did mean that Claire was at much greater risk of miscarriage and she was admitted into hospital for observation. Fibroids are lumps that occur in or around the uterus that are completely benign. They are not cancerous. Fibroids are diagnosed in four women in every ten but more women probably have very small fibroids that are never found. They only cause difficulties when they grow so large that they start to interfere with other organs, or when they bleed. Heavy periods and abdominal pain are common symptoms. 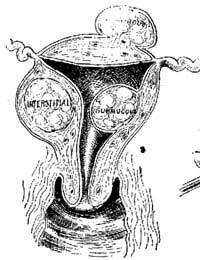 Large fibroids can press on the bowel or bladder and fibroids inside the uterus can lead to infertility. In Claire’s case, her doctors were wise to be very cautious and admit her into hospital. Fibroids increase the risk not only of miscarriage but also of a premature delivery. Large fibroids can also start to take up space needed by the baby. For Claire, this did not happen because her largest fibroid was flat. “If it had been spherical, I would have been in trouble,” she says. The main treatments for fibroids are cutting down the amount of oestrogen in the body (fibroids grow quickly in the presence of high levels of this hormone), or increasing the amount of progesterone, or surgery. A myomectomy can be performed to cut out the fibroids while leaving the uterus in full functioning condition. Some women who have completed their families and don’t wish to have more children may also opt for a complete hysterectomy, which solves the problem for good. “Obviously, none of these treatments can be done during pregnancy, so I had to be carefully monitored. Oestrogen is sky-high during pregnancy, so this was a very worrying time. The small fibroid inside the muscle thankfully hardly grew at all but the other small, spherical fibroid was the size of a tennis ball by the time that Jason was born,” Claire told FertilityExpert. A few weeks after the birth of her son, Claire went back to see the specialist in Hull, the nearest large hospital that specialised in fibroid treatment. “As I was not sure at that stage whether I would want more children, I decided against the hysterectomy option without much thought. I was not very keen on the surgery to remove the fibroids either, although the consultant did say that this would easily solve the problem of the external fibroids, which were attached to my uterus by thin stalks. He said that the stalks can become twisted, cutting off the blood supply to the fibroid, which then has to be removed as an emergency as the tissue starts to die,” explains Claire. Claire also did a lot of reading and found out that the reasons why fibroids form is not known, so it is difficult to know what to do to prevent them. She did find some studies that suggested that women who eat less meat get fewer fibroids, so she adopted a vegetarian diet. Her consultant also recommended that she watch her weight, as oestrogen production increases with body fat. “With the diet high in fresh fruit and vegetables and low in fat and meat, this was relatively easy and I also took up regular exercise. I don’t know if these things really made a difference but I felt a lot healthier and it helped me cope mentally,” concludes Claire. For the moment, the fibroids are under control and Claire has now decided to have a third child. "I know the risks, and I will need extra medical care, but I won't let my life be ruled by fibroids."